With banks and non-financial companies sitting on trillions of dollars because of the negative economic environment created in part by his policies, this new poster is both funny and troubling. However, I think this cartoon does the best job of capturing the destructive impact of big government on economic performance. Sort of makes you wonder what Obama will do for an encore if he has another four years. This interview with the IRS Commissioner is really irritating. 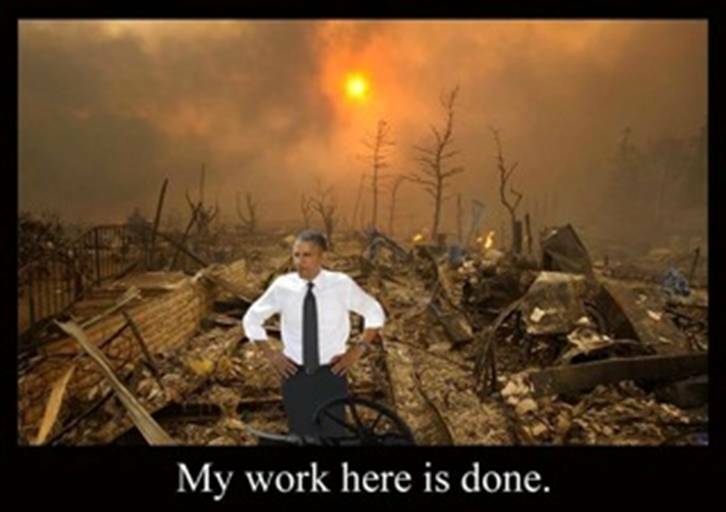 He wants us to believe that all the problems exist because of bad laws enacted by Congress. I certainly agree that the crowd in Washington is venal, corrupt, and duplicitous. But the IRS takes a bad situation and makes it worse, whether we’re looking at gross abuses of the regulatory process or absurd proposals to squander money on a P.R. campaign to make the agency more cuddly. So I’m less than overwhelmed by this performance. Commissioner Shulman also makes reference to a distasteful IRS proposal to regulate the tax preparation industry, which is really a scheme to enrich the big firms like H&R Block at the expense of smaller competitors. So that’s another black mark against the bureaucracy. But the most noxious part of the interview is when he admits he has to pay someone to file his tax return and then dodges a question on what could be done to make the system better. But that’s not surprising. Mr. Shulman oversees a bureaucracy with about 100,000 employees (bigger than the FBI, CIA, and DEA combined), and they obviously wouldn’t want the type of reform that would force them to get jobs in the real world. But I don’t have any problem with telling the truth. America should have a simple and fair flat tax. Actually, that’s just an interim step. What we really need is to restore a limited central government, as envisioned by the Founding Fathers. That way we wouldn’t need any broad-based tax to finance Washington. Supporters of individual liberty and national sovereignty have been skeptical of the United Nations, and with good reason. With the support of statists such as George Soros, the U.N. pushes for crazy ideas such as global taxation and global currency. But there’s another international bureaucracy, also funded by American tax dollars, that is even more pernicious. The Paris-based Organization for Economic Cooperation and Development (OECD) has the same leftist ideology as the U.N., but it actually has some ability to change policy. As you can imagine, this always means bigger government and more statism. Here are some examples. With this dismal track record, you probably won’t be surprised to learn that the Paris-based bureaucracy has a new propaganda initiative that seeks to bolster a left-wing redistribution agenda. And as part of this new scheme, it has put together numbers that supposedly show that there is more poverty is the United States than there is in bankrupt and backwards nations such as Greece, Hungary, Portugal, and Turkey. This isn’t April 1, and I’m not joking. Here’s a chart, produced from the data at this OECD website, which you get to by clicking the “Poverty: Country comparisons” link on this OECD webpage. You may be wondering whether the bureaucrats at the OECD who put together these numbers are smoking crack or high on crystal meth. Well, they certainly can afford lots of drugs since they get tax-free salaries (just like their counterparts at other international bureaucracies), but these numbers are the not the result of some ketamine-fueled binge. Instead, the OECD is lying. The website refers to “poverty rate” and “poverty threshold” and “poverty measure,” but the OECD is not measuring poverty. Instead, they have concocted a new – and deliberately misleading – set of data that instead measures the distribution of income. And if you’re wondering where they got this crazy idea, you probably won’t be surprised to learn that this is a scheme developed by the Obama Administration and it is designed so that “poverty” is only reduced if incomes become more equal, not if poor people become better off. Even moderates such as Robert Samuelson recognize this is absurd, and here is some of what he wrote. The most amazing thing about this crazy approach is that it makes it seem as if America has more poverty than nations such as Bangladesh, even though the average “poor” American has much higher living standards than all but the wealthiest people in the developing world. 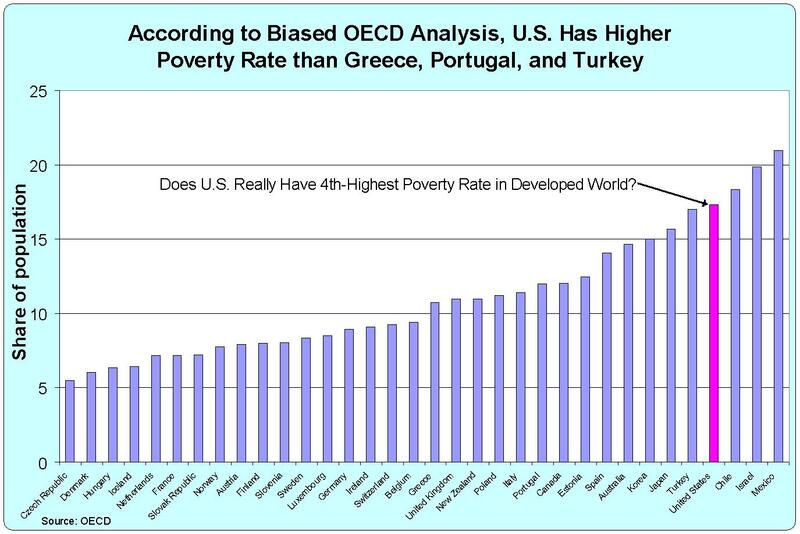 And it also generates the laughable numbers in the OECD dataset, showing that Turkey and Portugal have less poverty than the United States. The main thing to understand, though, is that this new approach is part of an ideological campaign to promote bigger government and more redistribution. Which is very much consistent with the OECD’s overall agenda, as this video explains. The real outrage is that American taxpayers finance the lion’s share of the OECD budget, even though it is a hard-left organization that pushes policies that are contrary to U.S. interests. And this is why I wrote that defunding the OECD is a minimal test of fiscal seriousness for lawmakers on Capitol Hill. Defining Austerity: What’s the Difference between a Libertarian, a Supply-Sider, a Keynesian, and an IMF Bureaucrat? I realize the title of this post sounds like the beginning of a joke, along the lines of “A priest, a minister, and a rabbi walk into a bar…”, but this is a serious topic. A big problem in fiscal debates is that people can’t even agree on what they mean by certain words. For instance, what’s the definition of austerity? Is it budget cuts, higher taxes, or both? Why are people saying the United Kingdom is practicing austerity, when the burden of government spending is going up? Or how do we define responsible fiscal policy? 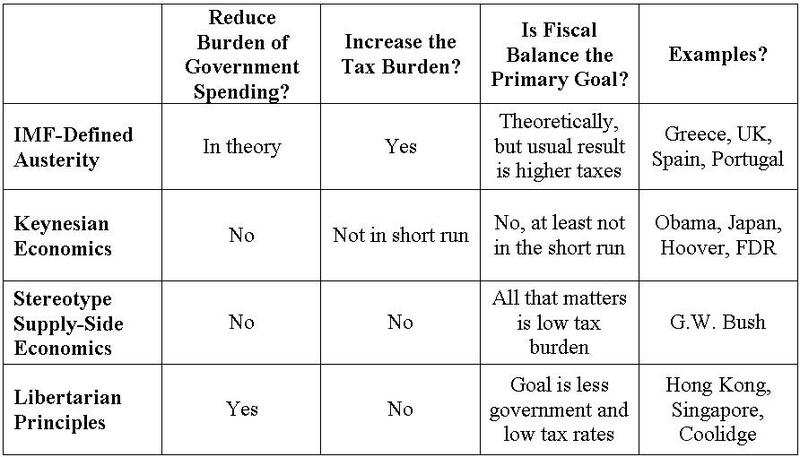 Should politicians try to balance budgets, or should they shrink the burden of government? Is it reasonable for some people to call Obama a conservative because he wants higher taxes and claims the money would be used to reduce red ink? I grapple with some of these questions in this appearance on Fox Business News. But I’m not happy with my performance, largely because there needs to be a simple way of categorizing the various approaches to fiscal policy. So that’s what I’ve done in this Table. This is a first draft, so I welcome suggestions. I’m serious about looking for input, For instance, I would like to come up with some way to describe Bushonomics without sullying the name of supply-side economics. But perhaps I am just sensitive to that issue because supply-side economists tend to be serious and sober people who favor smaller government, but some of the politicians associated with supply-side economics – such as Jack Kemp – have been unapologetic big spenders. I’m also unhappy with the division between IMFers and Keynesians, which is strange because it seems like half of my time is devoted to battling statists who argue for more government spending and the other half is consumed by fights against proponents of higher taxes. What makes this so frustrating, though, is that Keynesians and IMFers are usually the same people, even though the philosophies are supposedly inconsistent. I suspect that all they really want is bigger government, and they use any sign of weakness to argue for more spending, and then they quickly pivot and ask for higher taxes because of red ink. The biased analysis of the Congressional Budget Office is a good example. The right approach, needless to say, is libertarianism. Small government and low tax rates are the pro-growth, pro-freedom recipe. That’s the one part of the Table that’s right on the mark.